Geoff Haydon and Jim Lyke bring this well-known ragtime solo by Euday Bowman to life again in their two-piano arrangement. The melody is expertly divided between the two pianos and requires careful attention to the syncopation. The jump bass accompaniment typical to this style of music is perfect for dividing between the hands. The bright, swing tempo captures the character and spirit of ragtime making this an arrangement that will delight both listeners and performers alike. 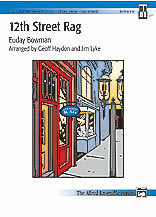 12th Street Rag for Piano By Geoff Haydon and Jim Lyke – Geoff Haydon and Jim Lyke bring this well-known ragtime solo by Euday Bowman to life again in their two-piano arrangement. The melody is expertly divided between the two pianos and requires careful attention to the syncopation. The jump bass accompaniment typical to this style of music is perfect for dividing between the hands. The bright, swing tempo captures the character and spirit of ragtime making this an arrangement that will delight both listeners and performers alike.